Whether you're looking for a cozy travel trailer or a big, luxurious 5th wheel, you'll want to see us at RV World MI for your dream RV at a price that will astound you! Although we're headquartered in the beautiful and growing community of Grand Rapids, Michigan, our fast, reliable worldwide delivery service has won us customers everywhere! 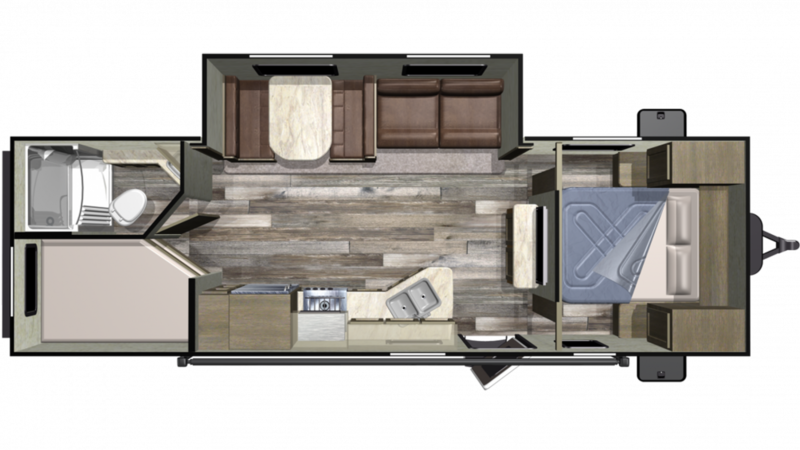 That's because we can save you $1000s on this 2019 Starcraft Autumn Ridge Outfitter 26BHS Travel Trailer! So come in and see us today at 7834 S Division Grand Rapids Michigan 49548 or go online and give us a call at 616-591-3632! Our friendly, knowledgeable staff offer personalized service to every customer, and we can tailor a deal just for you! You'll drive away happy in your dream RV, we guarantee! This is a well designed, well built Travel Trailer. It's 30' 7" and 8' 0" wide, with a rugged GVWR of 7500 lbs! The hitch weight of 765 lbs. and ship weight of 5770 lbs. make it very towable on the road. And the easy open 16' 0" patio awning protects your family's outdoor living from sunburn and UV damage! Everyone on the trip can get a good night's rest in this RV, which sleeps up to 10 people! Get a good night's sleep in the master bedroom, with its Queen bed! Avoid all those long trips to the communal restroom and enjoy the shower and Foot Flush toilet in this model's bathroom! With 60 lbs. of LP tank capacity, you can enjoy long hot showers throughout your trip! The used water and waste are stored in the 32 gallon gray water tank and the 32 gallon black water tank, respectively. You'll find 1 beds inside this cozy camper, thanks in part to the bunkhouse! Your guests and family will love the comfort of the Bunkbeds!